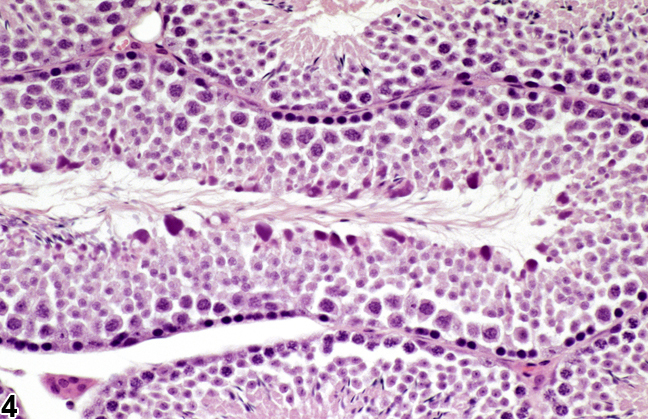 Testis - Atypical residual bodies in a B6C3F1 mouse from a subchronic study. 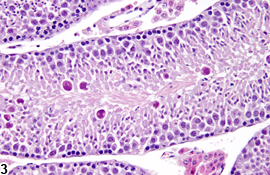 Seminiferous tubules show atypical residual bodies. 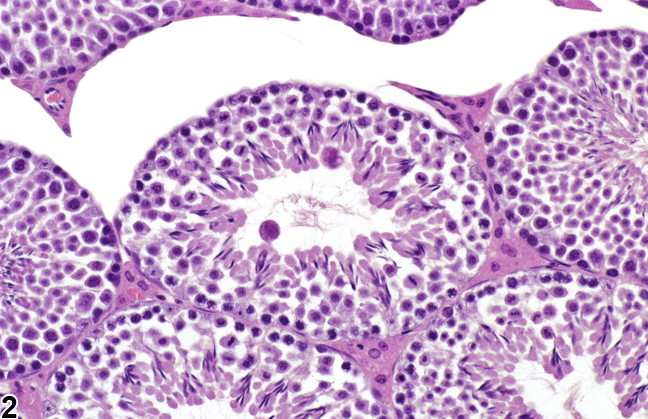 Testis - Atypical residual bodies in a B6C3F1 mouse from a subchronic study. 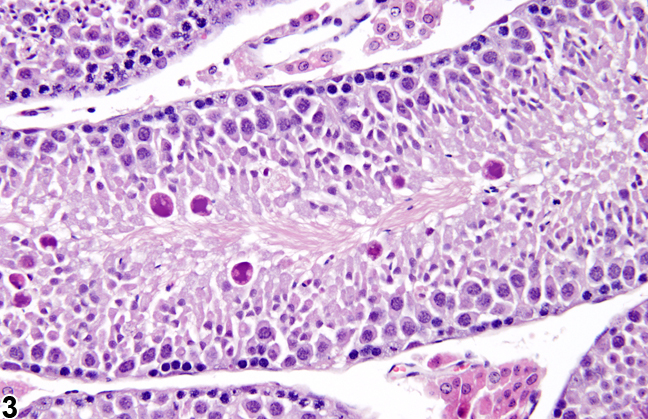 Atypical residual bodies in a seminiferous tubule. 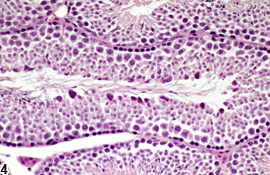 Testis - Atypical residual bodies in a B6C3F1 mouse in a subchronic study. 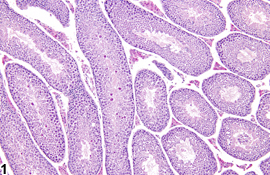 Higher magnification of the atypical residual bodies shown in Figure 1. 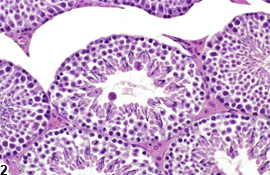 Testis - Atypical residual bodies in a B6C3F1 mouse in a subchronic study. A seminiferous tubule shows atypical residual bodies. Residual bodies are dense basophilic, globular bodies comprising redundant organelles and excess cytoplasm shed from the elongating spermatid in its final steps of maturation. They are generally seen at the luminal surface of stage VII and VIII tubules intermixed with the heads of the mature spermatids. Once spermiation has occurred, the residual bodies rapidly descend to the basal region of the stage IX and X tubule, where they are phagocytized and disappear. Abnormally large residual bodies can sometimes be seen as an incidental background finding in mice or as a chemically induced degenerative change in mice and rats. Atypical residual bodies are generally larger than normal and have the appearance of apoptotic bodies ( Figure 1 , Figure 2 , Figure 3 , and Figure 4 ). They are generally at the luminal surface or appear suspended in the lumen of tubules and can sometimes be seen in tubular stages where normal residual bodies are never present ( Figure 2 ). Their significance is unclear, but they probably represent a disruption of the spermiation process. They have been described in rats in response to administration of tri-o-cresyl phosphate and the water disinfectant chemical dibromoacetic acid. Atypical residual bodies should be diagnosed and graded and should be discussed in the pathology narrative if the incidence and/or severity appears to be related to chemical administration. Bilateral involvement should be diagnosed when present. Linder RE, Klinefelter GR, Strader LF, Suarez JD, Roberts NL, Dyer CJ. 1994. Spermatotoxicity of dibromoacetic acid in rats after 14 daily exposures. Reprod Toxicol 8:251-259. Linder RE, Klinefelter GR, Strader LF, Veermachaneni DNR, Roberts NL, Suarez JD. 1997. 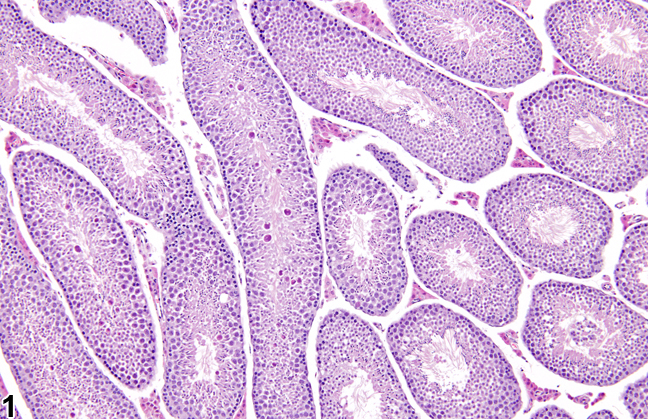 Histopathologic changes in testes of rats exposed to dibromoacetic acid. Reprod Toxicol 11:47-56. Somkuti SG, Lapadula DM, Chapin RE, Abou-Donia MB. 1991. Light and electron microscopic evidence of tri-o-cresyl phosphate (TOCP)-mediated testicular toxicity in Fischer 344 rats. Toxicol Appl Pharmacol 107:35-46.